This week sees the debut of our new ‘King of the Hill’ game mode. The team have spent many weeks chained to their desks and have worked valiantly to bring this awesome new addition to you. This mode utilises the current ‘Whiplash’ map, and as before, players are divided into two opposing forces. Teams are then tasked with fighting over and capturing a randomly selected POI aka ‘The Hill’. They must then hold the location for a full five minutes against attacks from opposing hostile players and the ever-present zombie hordes. If successful, the holding team is awarded one point. The objective then changes to a new location, a new ‘Hill’ and the slaughter begins anew. At the end of each game, the team with the highest points total is declared the winner. Each game instance will run for 60 minutes. The audio team has been working on improving vehicle sound, in particular, eliminating repetition within vehicle engine audio and sound attenuation. So now you can look good and sound good as you race around the map. The Master and SFX audio sliders in the options menu now affect everything including UI sounds and the splash screen. There have been some improvements to the UI around the integrating the Steam browser into DOTI’s main menu. Following the launch of the vehicle demo mode in the last build, we are adding two new vehicles to the lineup for you to try out. The Mammoth APC and the iconic US school bus, we hope you have fun testing them out. 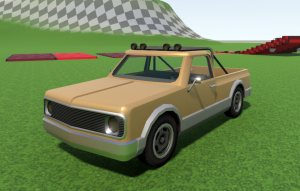 The team have also made some improvements to vehicle physics to reduce the chance of tipping or flipping vehicles over. We also have two new vehicles lined up for addition to the motor pool in the near future. The Chevy inspired ‘Vaquero’ and the ‘Badger Cajun’ vintage pickup truck. 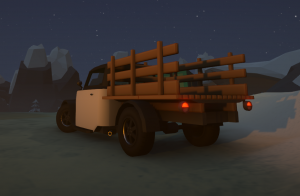 Keep your eyes peeled, while these are not driveable, you may see them parked up somewhere in-game. We are continuing to work on the upcoming new character model, specifically controller, animation and visual improvements. The winning picks for inclusion in the next build were ‘Hit direction indicators’ that will allow players to see the direction of incoming fire, and ‘Damage multipliers’ so those hard to get headshots will do even more damage. Your top picks for future development were ‘new content’ and ‘bug fixes’, with performance coming in a close third. 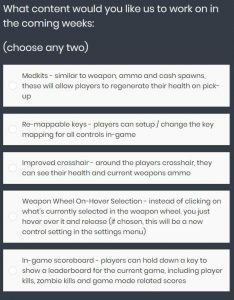 We also have a new poll for you to select the features you would like us to concentrate on in the coming weeks. We hope you can find time to take part and help steer the development of The Day of the Infected. Don’t forget the weekly public playtest today at 4pm EST. This is your chance to play alongside the dev team and maybe even pick up some nice weapons from our mutilated corpses! We hope you have fun with the new build and appreciate any assistance finding and squishing those pesky bugs. Join us on Discord and leave your feedback and suggestions, we value your input and help in making the best game we can for you, our players.